WELCOME TO HORSE BOOKS PLUS A little bit about us:Members of the Virginia Antiquarian Booksellers Association since it's inception, we are a unique and personalized specialty book finder and seller located at November Farm in the foothills of the Blue Ridge Mountains of Virginia. It is in these hills and fields that the country's heartiest and perhaps most dedicated fox hunting enthusiasts gather and ride to hounds in pursuit of Reynard, the elusive one. 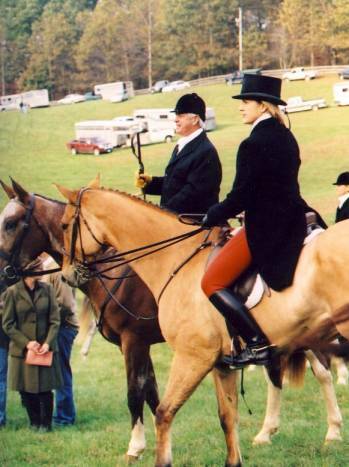 Having had a life long history with horses, including fox hunting, showing, breeding, and teaching riders young and old, we at HORSE BOOKS PLUS offer a wealth of experience and a love for all horse & field sports. Owner Karen Wild is especially apt at helping clients develop collections at every level. While particularly keen on sporting and children's libraries, new challenges are welcomed with enthusiasm. Offers to purchase are welcomed. Whether you have a single volume or an entire library, we will offer discreet and candid advice to ensure that you get the most out of your investment or cherished family heirloom. We carry thousands of rare books on all topics separated into easy view catalogs. If your book is not found in our store, please email us the author, title and condition you are seeking (such as: paperback or hardcover; collectible first edition or good solid reading copy), and we'll have your details with us when we go to out of the way bookstores and contact our network of thousands of colleagues. When we find your book, we'll email you the cost inclusive of your choice of shipping, just say yes please or no thanks. No pressure. PHONE 10 AM - 6 PM EASTERN 540 547 4005 Thanks for stopping by!Best wishes from HORSE BOOKS PLUS in the historic Virginia Piedmont.